Cladding and Facades specialists in the UK. BW Industries SFS range is used for infill panels, continuous walling and high separating walls. We supply our Cold formed galvanised SFS sections in stick form for assembly on site, and manufacture the components cut to length to suit individual applications. They can be supplied in either plain lengths or pre-punched for services etc. BW Industries SFS framing offers many advantages over traditional methods of construction such as speed of erection and completion on site, increased stability and durability and reduction of weight. Our sections are robust and sufficiently light for site handling and they don’t suffer from shrinkage or settlement in comparison to timber and masonry. The benefits are both time and cost effective, making our SFS framing a popular option to many. With a dedicated and knowledgeable team of experienced personal, BW provide an excellent and unrivalled service from the point of initial contact right through to delivery of the steel on site. We offer a wide choice of finishes for your cladding, to reflect your business brand. Select from a range of colours, textures and visual effects to create the right façade for your company. All Benchmark cladding systems conform fully to BREEAM and meet Park L revised legislation. This means that they comply with the standards necessary to reduce impact on the environment. The flexibility of the cladding material means that even complex buildings can be covered; without compromising on quality, water-resistance or finish. Range of looks. Select from a traditional wood finish, a futuristic metal façade, or use vibrant colours to grab attention. Flexible. Kingspan’s products are designed to be flexible, meaning they can be used even on more complicated building exteriors. Simple to install. The products are designed for easy installation, which helps keep costs down. Environmentally friendly. Benchmark products conform fully to BREEAM and meet Park L revised legislation, ensuring they help reduce impact on the environment. 1) Multipanel UK: We manufacture and supply a range of Alupanel® aluminium composite panels. The flagship Alupanel® sheet combines durability with flexibility. 2) Euroclad: Euroclad® is the UK’s home-grown, independent supplier of metal roof and wall products which provide exceptional acoustic and thermal performance for the life of a building. Products are sustainably credible with proven routes for recycling and disposal. At Euroclad® we listen to your needs and offer high performance, cost effective solutions. 3) PSP Architectural: Turning architectural concept into engineering reality is fundamental to the corporate philosophy of PSP Architectural Ltd. PSP incorporates a design driven strategy throughout all operations ensuring that innovation & economy are at the forefront of its culture. 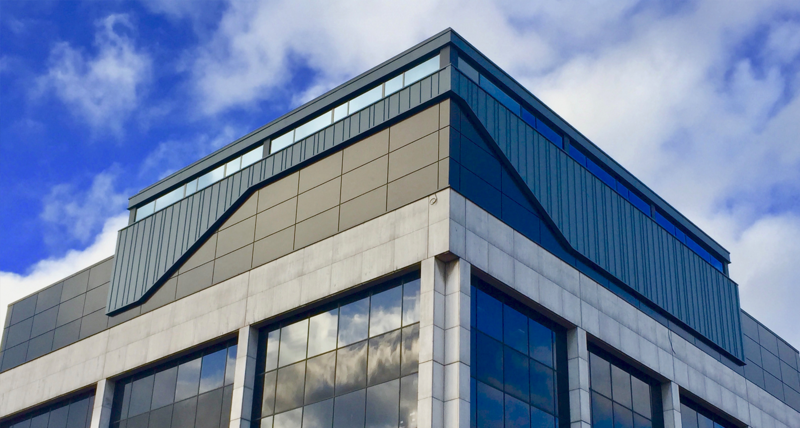 We design, manufacture and supply rainscreen cladding, specialist fabrications, rainwater goods, ventilation, solar shading, flashings, pressings and façade support systems using a range of different metals to suit our customers’ needs. If you’d like to find out how IPS Group’s comprehensive design and installation services, simply get in touch with the team today by calling 01969 625000 or emailing info@ipsroofing.co.uk. Peace of mind comes from over 40 years of experience and development, backed up by rigorous laboratory and real world testing. Short lead time service is assured in order quanities that suit large, small or phase build developments. Tata Steel understands that truly sustainable kerb appeal comes from excellent aesthetics, performance, and eco-credentials. Colorcoat Urban® by Tata Steel is the sustainable product of choice for the urban building. Choosing the right profile for Colorcoat Urban® by Tata Steel is crucial, particularly in relation to the size of the building. For 1-4 storey urban roofs the small standing seam, either traditionally formed or using the innovative Urban Seam® profile, is ideal for creating a fantastic modern aesthetic. Urban roofs: Traditionally formed or Urban Seam® standing seam profile are the ideal choice for low rise and residential roofs. The roofs are finished with crisp, neat detailing to a scale that is suitable to the building size. The profiles are applicable over a substructure of a fully boarded out truss, SIPs and fully boarded out metal frame construction. Examples of building typographies include 1-4 storey houses, low rise apartments, 104 storey public and commercial buildings, schools and sports pavilions. Large urban roofs: A range of popular insulated and un-insulated profiled systems including standing seam and concealed fix are available. Examples of building typographies include apartments, schools, public buildings and offices. Refurbishment and renovation: Colorcoat Urban® by Tata Steel is also the ideal choice for refurbishment and over roofing, due to its inherent light weight and strength.